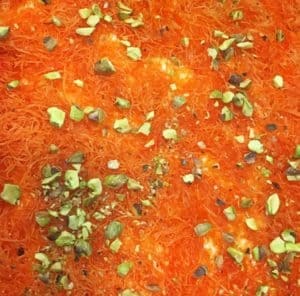 Let me introduce you to Kanafeh; the mother of all Middle Eastern desserts. Growing up; I never had a sweet tooth. I wasn’t the girl you would give chocolates too as a present because I simply didn’t like it! Crazy, right? Well, those days are long gone; I now crave decadent desserts but make sure not to indulge too much. A few bites here and there never hurt anyone. Kanafeh is one of those desserts that is a staple in most Arab households. The light and crispy phyllo layered with melted sweet cheese topped topped syrup and crushed pistachios is just divine. Sounds amazing eh? The best part is it’s so easy to make! First, you want to make sure your phyllo dough and cheese is defrosted and ready to go. Then you take all the phyllo and start shredding it with your hands; doesn’t have to be perfect. The strands should be around the size of a grain of rice; a little longer is fine too. 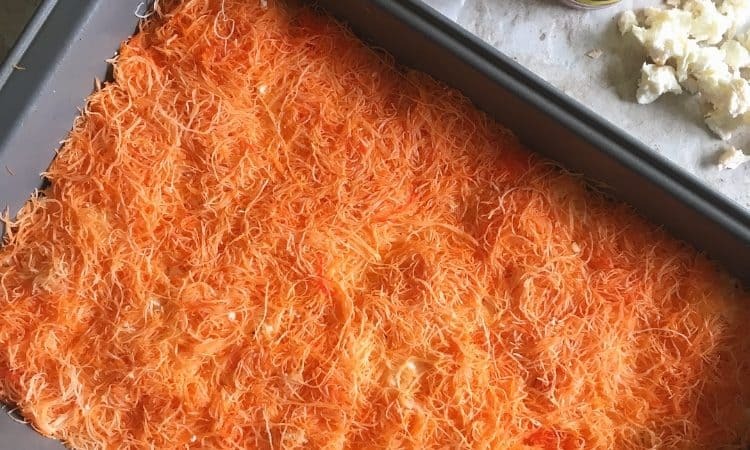 Add the melted butter to the shredded phyllo along with the kanafeh dye and mix with your hands till you get a nice light orange color. Then, take a little less than half of your phyllo dough and spread evenly across a baking pan about 9×13 in. in size. Crumble your cheese in a separate bowl with the ricotta and then add that evenly on top of your phyllo layer. Add the rest of your phyllo generously along the top of the cheese. Patted down the layers as you go. Preheat your oven to 400 degrees; cover your pan with foil and bake for 20 minutes; then bake for another 5 min uncovered. You know the kanafeh is ready when you can see the cheese is melted and edges are a light brown crisp. Now make your syrup; which is basically mixing the sugar and water in a small pot and letting it bowl to medium heat. Stir consistently till the sugar is fully dissolved and mixture is slightly thickened. Once kanafeh is done, pour syrup using a spoon across the hot kanafeh. Don’t go too crazy! You can always add more syrup later if you choose for it to be sweeter. Garnish the top with some crushed pistachios. There you have it folks; amazing simply made Kanafeh! Next Post Pesto Pasta – Simply Delicious!